Continuous feedback is an essential element of any healthy & productive work environment, but often we don't contribute to the feedback loop primarily because of logistics. 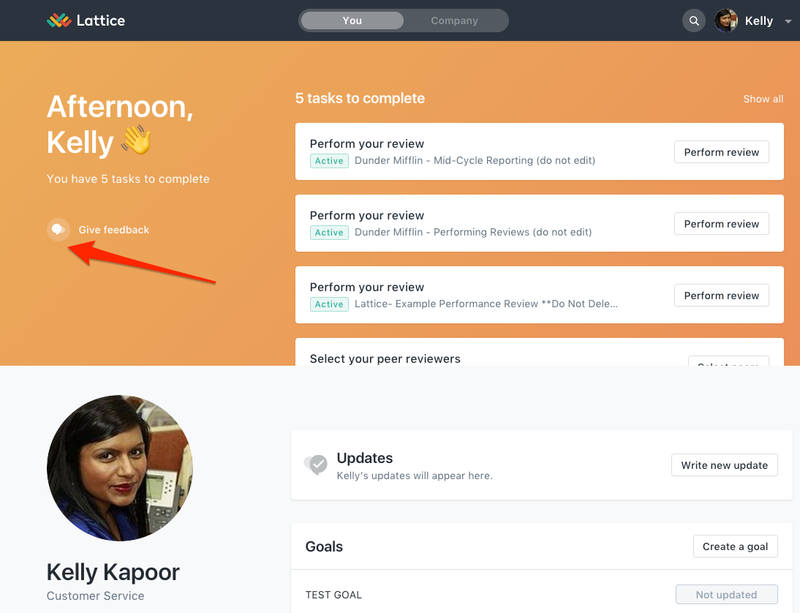 Luckily, the Lattice feedback feature makes it super easy to give, receive and store feedback for future reference. 1. Toggle to "You" & locate the "give feedback" icon. 2. Under feedback you will have the choice to Give Feedback, Request Feedback or leave a Note to Self. 3. Start typing the name of the recipient in the "who are you giving feedback to?" and the field will auto-populate. (Note, You can select up to six people to give public feedback to at one time). 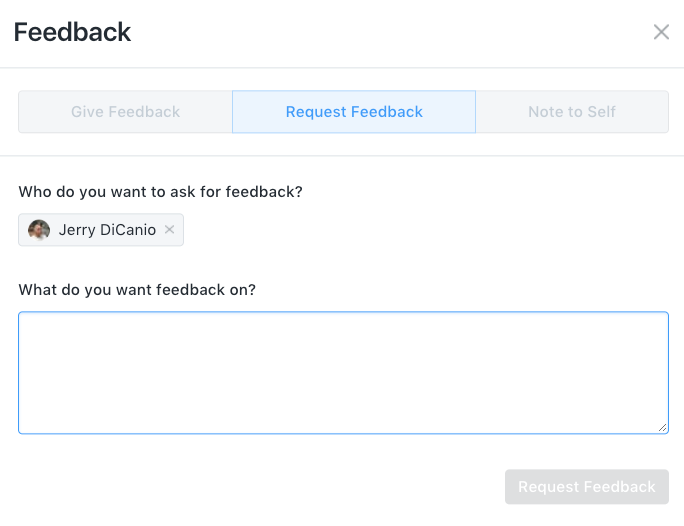 After selecting the recipient(s), write your feedback message in the "What's your feedback on" text box. If your admin has set up company values, you can associate a value to the feedback before submitting the feedback. 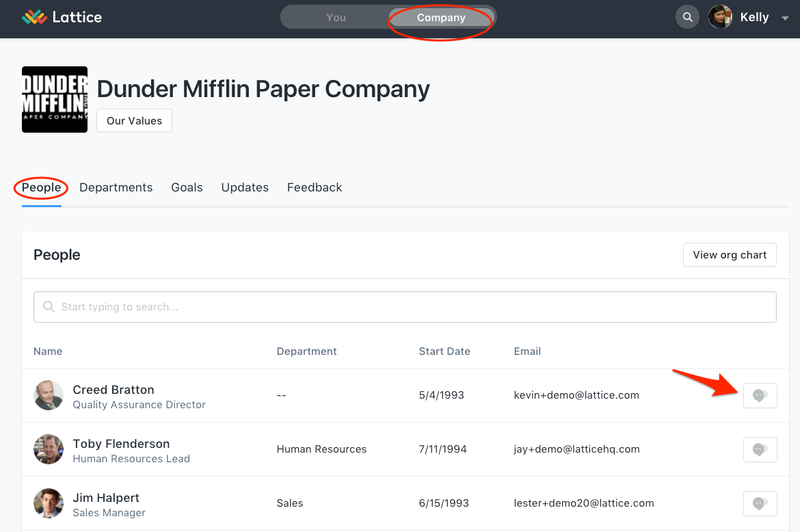 Choose your share settings - either private (shared only with the recipient and potentially their manager depending on your company's settings) or public (shared with your organization). Start typing the name of the recipient in the "who do you want to ask for feedback?" and the field will auto-populate. 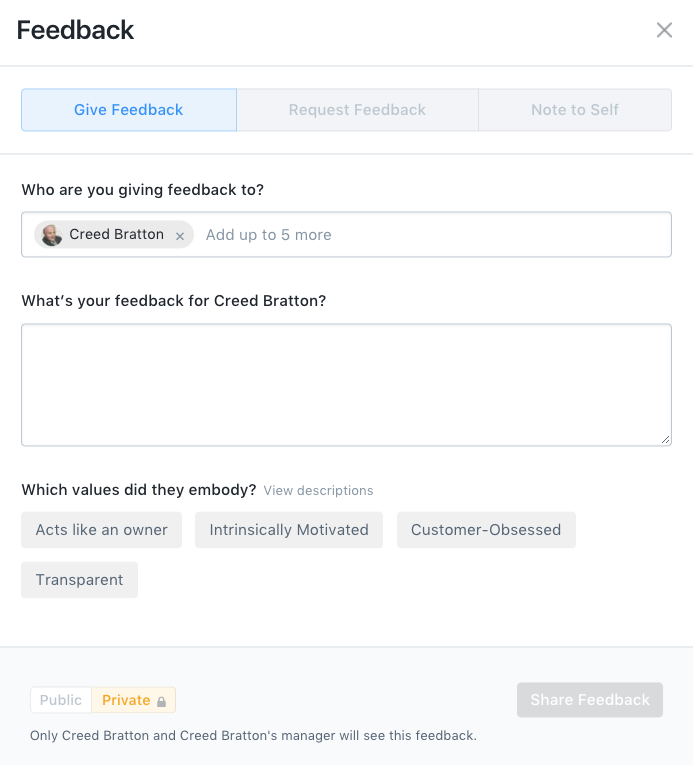 Write your feedback request message in the "What do you want feedback on?" text box & hit request feedback. The request will appear in the recipient's Lattice feedback feed & an email notification will be sent. Note, the recipient can only respond to your request privately - but the feedback will live in Lattice. Start typing the name of the recipient in the "who is the note about?" and the field will auto-populate. 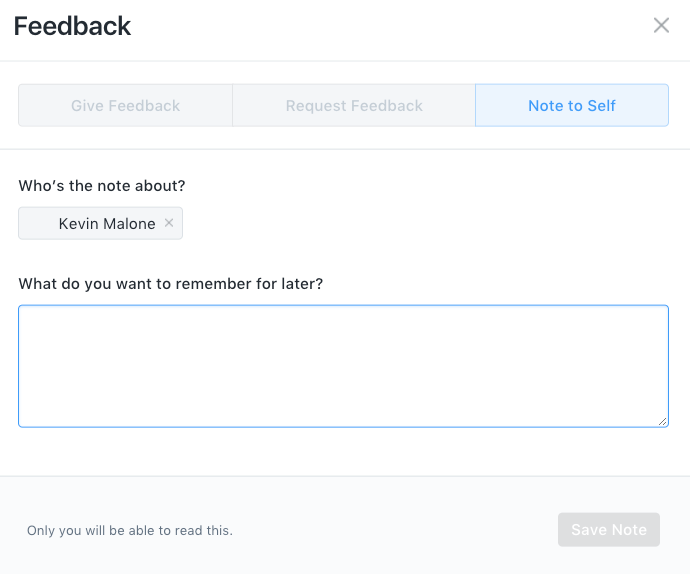 Write your feedback request message in the "What do you want to remember for later?" text box & save note. Note, only you will be able to see this note & it will live in your Lattice account. [Bonus points] The more notes you can make about your teammates, the easier & more well rounded review you can give later. 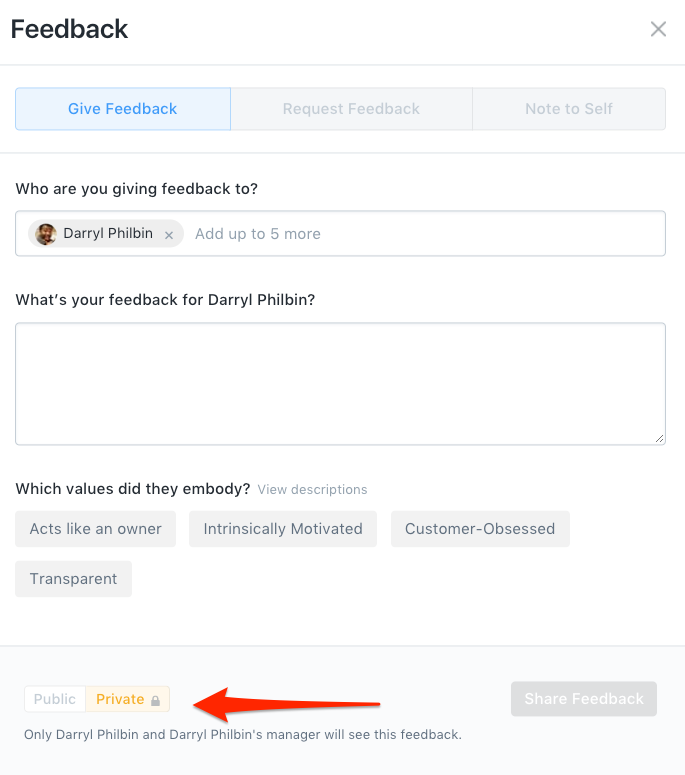 Once you click on the feedback icon next to an employee, the Feedback tool will function the same - except the employee's name will be pre-populated (you can edit this). When giving positive feedback, try to be as specific as possible with references to actions. For example, instead of saying "Great job this week! ", try adding more color "Great job this week! I was very impressed with your organization & leadership skills as you onboarded our new hire Angela." When giving constructive feedback, try to frame as an actionable item rather than a direct criticism (and make sure to explain why the feedback is important). For example, "Overall, I thought you did a good job on the X Client meeting this morning. I did notice that your slides were not loaded before the meeting - next time, please make sure everything is set up before to save time. Thanks!" Any feedback that you give or receive will be recorded in your Lattice feed under Feedback which will come in super handy when it's time to complete the review the cycle. Does your organization use Slack or Gmail? Good news, you can give feedback directly through our integrations!